I loved these books! It's not often I read books from a male's point of view, because I don't like them as much. It's harder for me to relate with them, being a girl myself. But these stories were so well written, that it didn't matter that Alex was male! I enjoyed following along while he learned about his new church and helps them along the way. A great read! I received this book free for review from LitFuse Blog Tours. I was not required to post a positive review, simply an honest one. 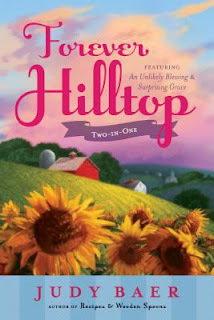 @JudyKBaer is giving away a Kindle for YOU … and one for a Friend in her Forever Hilltop Giveaway! Celebrate with Judy by entering to win a Kindle for you and a friend! Enter today by clicking one of the icons below. But hurry, the giveaway ends on May 22nd. Winner will be announced 5/24/12 on Judy's Blog. Don't miss a moment of the fun. Tell your friends via FACEBOOK or TWITTER and increase your chances of winning. Hope to see you on the 21st!